Why is your dog having potty accidents? When it comes to potty training a dog, regardless of age, the first step is to not allow an opportunity for it to happen. You may be asking, how do I do that? I can’t be on top of my dog all the time. I’d like to relax, too! Not to worry, it’s quite simple, really. When you’re home, you can tether your dog to you by keeping them on a leash. Tether this leash to you. Either to your wrist, or to your belt. This prevents your dog from being able to sneak off somewhere to eliminate within the household. Your dog does not act out of spite. They do not hold grudges. Punishing your dog for an accident can often make the situation worse, and often times when you get a new dog, they will learn each other’s bad habits. • Ignore your dog when you first arrive home. Do not reward any whining or excited behavior with your attention. Be a statue, remain standing, and ignore your dog. The second your dog settles, time to go outside to potty. • Give lots of praise and even a small treat when eliminating in the proper area. • DO NOT PUNISH! Punishment after the fact will not help and can make the situation worse. • Frequent bathroom trips to create a training pattern for them. That way they start to anticipate frequent outings and will learn to hold it. Since most accidents tend to happen when you’re not home to let your dog out to potty, we will also be talking about the use of a crate for when you’re away. This is one of the easiest methods to potty training your pooch, and has a wide array of benefits. It is the dog's bed and sanctuary. Its purpose is to provide confinement for reasons of safety, security for the dog, house-training, prevention of destructive behavior, and/or travel. These are your basics for potty training. Now we’re gonna look at other areas that you may be struggling with. Some of those can include excited peeing for when you or guests greet your dog, medical issues, or territorial marking. These can be a little more complex because they are reliant on external or internal influences beyond just a need to potty. • Do not make eye contact with your dog. Instead, watch their ears, their nose, their shoulders, the top of their head. This is less overwhelming for your pooch than direct eye contact. • Talk in soft, neutral tones. No baby talk! Do not try to use a soothing tone. The more matter-of-fact you are, the easier it will be for your dog. • The less direct you can be with your dog, the easier a time they’ll have. Ask guests to completely ignore your dog until everyone has gotten settled from the initial excitement of coming into the home. Even then, direct and over-excited energies should be avoided until you have worked with the dog enough to see a consistent improvement and then you can test them out with certain guests that may usually cause that excitement piddling. • Crate training can be a big help here. • Use an E-Collar. We here at Ruff Beginnings Rehab recommend the use of the Mini Educator. This is a wonderful communication tool for you and your dog that is less invasive. Whenever you see your pooch giving prelude behaviors to marking(sniffing, side-stepping to line up for the leg lift, the leg lift), you give a correction. Contact us for more information. • Keep the dog tethered to you so that you can use some sort of communication tool(martingale, pinch collar, prong collar, etc.) that sits around the neck. This gives the dog zero opportunity to urinate without you being aware. 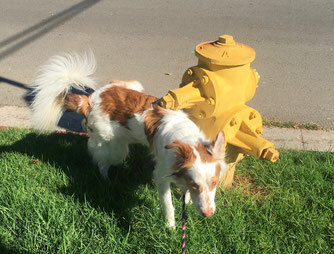 If the dog manages to pee inappropriately while tethered to you, I hate to say it, but it means you need to be paying more attention or keeping a closer tether of your dog. • After giving a correction, wait a couple beats, then calmly go outside and lead your dog into the grass or preferred substrate. Be as boring as possible and give them 5 to 10 minutes to eliminate before heading back inside. • Introduce your pooch properly to whatever may be making them feel uncomfortable, be it a person, another animal, or perhaps even a new piece of furniture. So long as your dog is uncomfortable with these 'new' things, they should not be left unsupervised, especially around new furniture when they're more liable to mark. Understand that with a young puppy it is NOT territorial marking and you probably need to go back to basics of potty training. As always, never hesitate to contact a professional. I hope you find these tips helpful. For more information, never hesitate to reach out to us. Simply follow the Contact tab at the top right of our page.